Great condition with straight neck; Original brown sunburst finish, trapeze plated tailpiece, bound head, neck, back, and German spruce top; single cutaway body. The original pick guard had been removed and there was some pick wear on the finish. 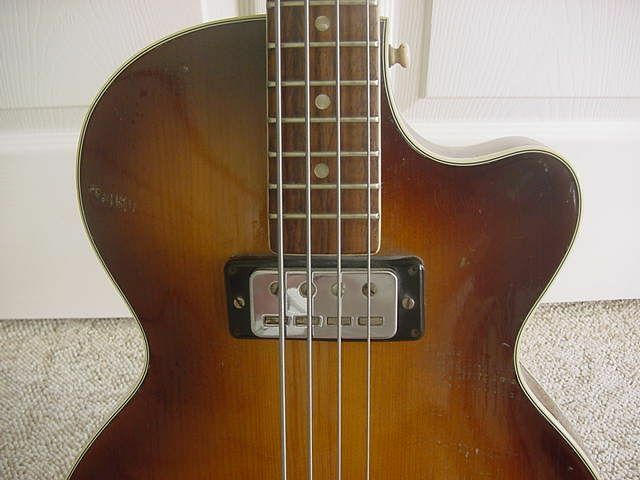 One of the volume knobs was missing - I replaced it with a Vintage Hofner knob. See pics, including original serial number and "Made in Germany" stamp. 22 frets, Flamed maple carved back, Maple/Beech neck, Rosewood fretboard, mother-of-pearl dot inlays, Ebony Bridge with moveable saddles, 2 Volume controls, swithces for Bass, Treble, Rhythm/Solo. This was the best hollow-bodied bass I have ever played. It has that perfect Paul McCartney bass sound. I first saw Tina Weymouth of The Talking Heads playing one of these, and searched for years before I found this one. Was sad to let it go.